Customers who waited to order their new iPad from Apple's online store will now also wait two to three weeks for their order to ship. Estimated shipping times for new iPad orders have slipped yet again, with all models now advertised to ship within two to three weeks. That applies to both black and white colors, all capacities, and even the 4G LTE models compatible with AT&T and Verizon. Customers can still attempt to get their hands on a new iPad by waiting in line at an Apple retail store. The company will have additional units available for purchase at its brick-and-mortar locations for this Friday's official launch. 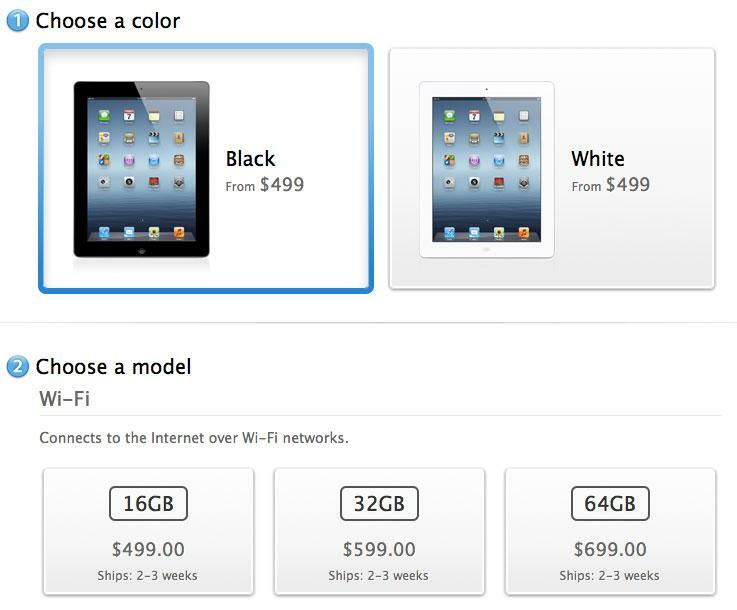 While demand for the new iPad has forced Apple to delay estimated shipping times, the wait for an iPad 2 remains unchanged. Both black and white 16GB Wi-Fi-only models, available for $399, ship in one to three days, while the 3G-capable models have an identical estimated shipping time. Over the weekend, Apple issued an official comment on the strong demand it has seen for the new iPad, which led to the initial batch of preorders selling out in just two days. "Customer response to the new iPad has been off the charts and the quantity available for pre-order has been purchased," a company spokesperson said. "Customers can continue to order online and receive an estimated delivery date." Launch-day iPads sold out from Apple's online store last Friday, and Apple began to advertise that new orders would ship by March 19. But as of Monday, customers will have to wait up to three weeks to receive their new iPad. Those who were among the first to preorder the third-generation iPad have already begun receiving notifications that their order has shipped, and many packages are being held at FedEx shipping centers in Nashville, Tenn., or UPS facilities in Louisville, Ken. However, the iPads are not scheduled to actually be delivered until Friday, the product's official launch day.